Going back to June 2, 1995, Mayawati, while addressing a public rally, had announced withdrawal of support to Mulayam government which came into minority. 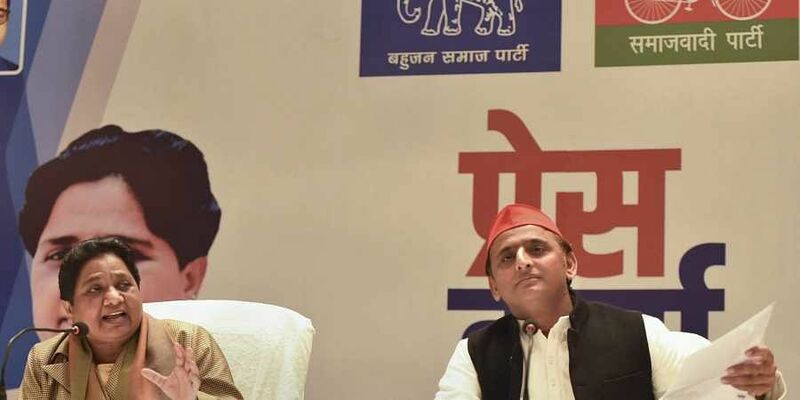 LUCKNOW: Political compulsions might have forced BSP chief Mayawati to forget 1995 guesthouse episode in which she was allegedly held hostage and assaulted by SP workers after BSP pulled out of alliance government in UP, her pain surfaced when she did not forget to mention it twice during the joint press conference while announcing the alliance with SP chief Akhilesh Yadav in Lucknow on Saturday. "We have stitched up this alliance keeping June 2, 1995 guest house episode behind in the national interest," said Mayawati and later Akhilesh balmed her by reassuring her that he will save her honour in future and that her insult would amount to be his own insult. In 1993, SP-BSP had cobbled up an alliance to defeat BJP then riding high on Ram temple wave. The then SP chief Mulayam Singh Yadav and BSP founder Kanshi Ram had come together winning 176 of 425 Assembly seats. The BSP had got 67 seats and SP 109. BJP had got 177 failed to form the government as other 'secular' parties including Lok Dal and Congress had backed the alliance. But clash of egos and interests wronged the tie-up and it ended in 1995. Going back to June 2, 1995, Mayawati, while addressing a public rally, had announced withdrawal of support to Mulayam government which came into minority. After withdrawing from the alliance, as Mayawati was holding a meeting with the BSP MLAs in room no 1 of state guest house in Lucknow, suddenly, infuriated SP workers barged into the room and surrounded Mayawati misbehaving with her in worst possible manner and were on a rampage with an intent to assault her. Scared Mayawati locked herself in the room. Getting the wind of it, senior BJP leader and party MLA from Farrukhabad Brahm Dutt Dwivedi rushed to the state guest house with his party workers and rescued Mayawati. This gesture of the BJP was followed by its extension of support to the BSP which formed the government in the state and Mayawati became the first Dalit chief minister of Uttar Pradesh.